BIS GCHEx & CFC CH DUSHANBE'S DREAMBOAT, CGN RAE2 RM CD (sired by BIS BISS Can Am Ch Summerhills Blackpaw out of Ch & CFC Elite Ch Dushanbe's Wintermist Showboat, CGN RI PCD TT ROMC). Crush has been a dream come true from his first day in the show ring. 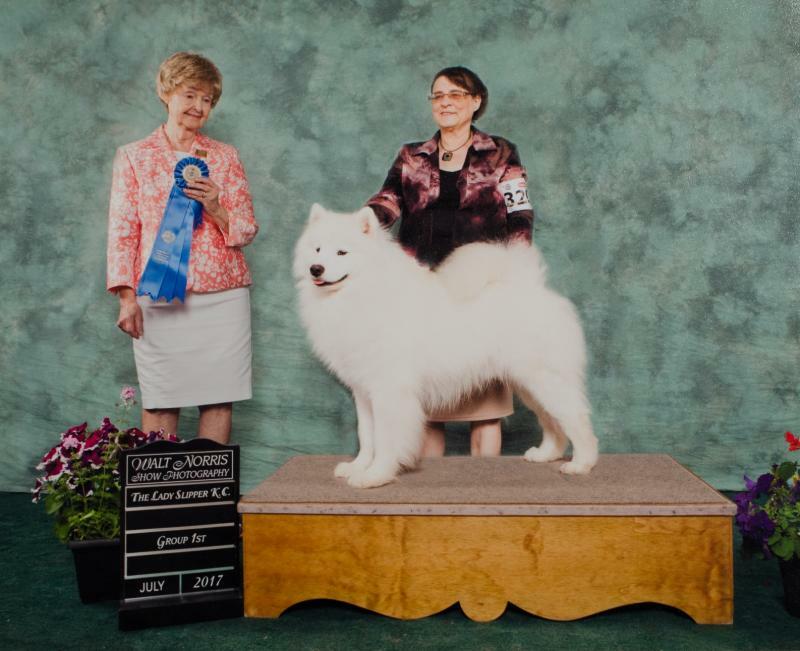 He was THIRD TOP SAMOYED IN CANADA in 2015 and TOP SAMOYED for dogs defeated at the breed level. In 2017, he was ranked FOURTH TOP SAMOYED IN CANADA. In 2016 and 2017 he was TOP RALLY OBEDIENCE SAMOYED IN CANADA and ended 2017 as #3 in the Working Group for Rally and #15 ALL BREEDS for Rally. Crush is a multi Group First winner finishing 2017 with an 85% group placing average per best of breed wins. He is a clean mover with a gorgeous head and coat and his personality is fantastic to live with. "Cupid" and "Rudi" from his first litter (out of Vixen) have each won multiple Best Baby Puppy in Group. Rudi finished his championship in July, 2017 in PEI with a Best of Winners and Best Puppy in Group, shown by Laurie Francis, and Cupid completed hers in October plus won two Best Puppy in Group wins, including one at our SAC Booster in May, shown by Robyn Pennell. "Dash" came out in September 2018 and swept to his title with three Best of Breeds and a Fourth in Group. Crush's kids "CANDY CRUSH" and "SURF" from his litter out of our "Harleigh" completed their championship in early June, 2018 with Surf taking a Fourth in Group and Candy a Best of Breed and her third Best Puppy in Group. BBPIS BPIG CH DUSHANBE'S LOOKING MINT, CGN RI ( sired by CH & CFC Ch Dushanbe's Make Mine Cool Mint, CGN RN PCD out of GCH Snowshoe Let's Ride, RN TT ROMC). Mint was quite the precotious puppy right from the start and won Best Baby Puppy in Group her first weekend out at the shows at barely three months of age. She added a few more baby puppy groups as well as a Best Baby Puppy in Show in October, 2016 in PEI. 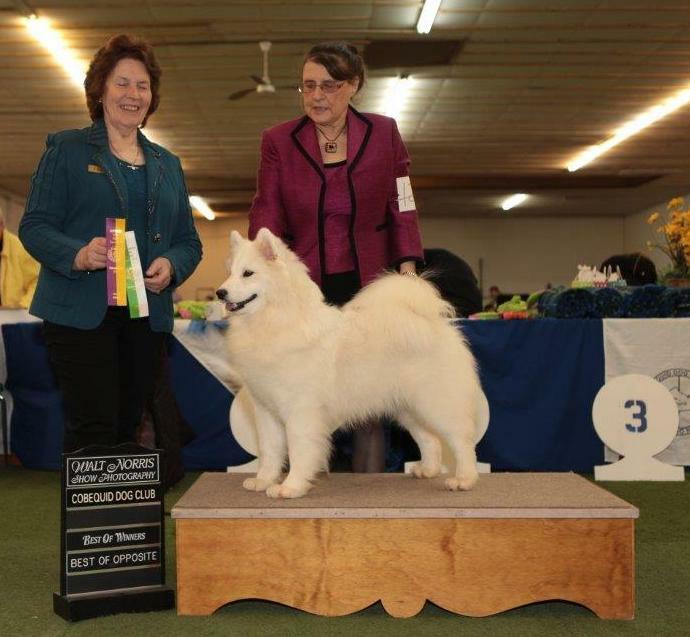 In early 2017, she completed her championship in only two weekends including winning Best Puppy in Group under Samoyed Breeder judge, John Muldoon from Ireland. To keep her occupied for the rest of the year we did some training in rally and she earned her Rally Novice title during the summer and her Rally Intermediate title in the fall. She is a clean mover front and rear and also has an amazing sidegait.